When I opened up my blog to write this overdue post, I had to dust off a few things. That made me sad. “Hi, wittle bwoggy. It’s been too wong,” I cooed at it as I walked around and stared at things like post number, page views, ads, etc. I really did love this blog for so long and took such great care of it. My life has been overcome with other things that don’t allow much extra time for tinkering with the keyboard. I miss it, though. I miss it, miss it, miss it. So, I have a lot to thank Mazda and STI for… Not only for the opportunity to drive yet another awesome car around for a week, but for also getting me into my blog space and finally typing something out, for goodness sakes. Mazda, you’re awesome. STI, you’re awesome, too. Readers, you’re even more awesome. So, after I tell you a little something something about the 2015 Mazda CX-9 Grand Touring, know that I plan to come back not too long after to tell you about something much less important. I’m sure that has you on the edge of your seats. Seriously, I have stories to tell! Stories that are much more fun to tell in a blog format. I’m going to type out some keywords- movies, air freshener and car washes. That should get my memory going the next time I’m fiddling around this Break Room. Right now, though? 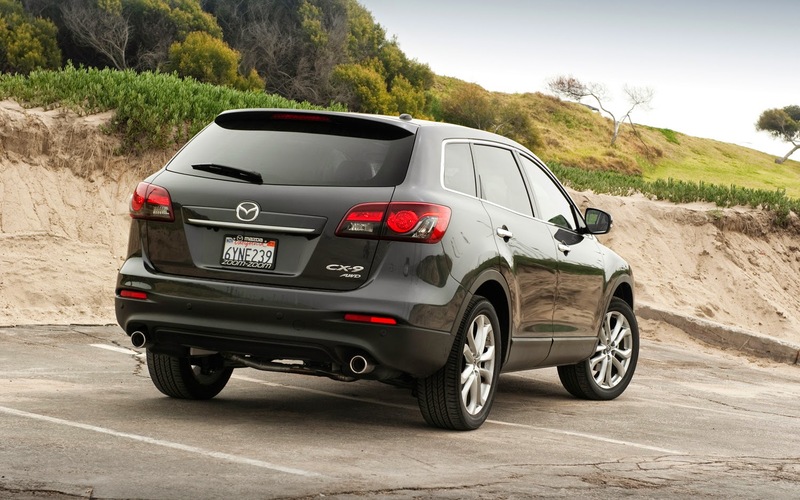 It’s all about 2015 Mazda CX-9 Grand Touring. I had the privilege of driving this car around, but it’s been some weeks ago. Shame on me! The delay in writing about it is not because I’m not absolutely grateful for the opportunity. I am! I so am! In fact, one of the STI employees remarked that I am one of the most grateful people he has worked with. Ha! Surely that doesn’t have anything to do with the fact that my car is a 2007, has a broken door and an air conditioner that doesn’t work in the front row and then the fact that they drive up with a gorgeous car for me to have for a week? I am so, so grateful. I mention that it’s been some weeks ago because in that span of time, I have apparently deleted all of the pictures that I took of the SUV. I had some great shots, too! So, I have to rely on the pictures I found on-line. Boo. Nice and sleek, right? I like that Mazda sign. It reminds me of a bird’s wings. It’d be nice if they’d make that car with some wings. I’ve got places to be and, in most cases, I was supposed to be there five minutes ago, dingdangit. The front seat area is looking pretty snazzy, too, don’t you think? One of my husband’s favorite features of the car, with the exception of it’s full tank of gas when STI dropped it off, is that split console area. Does the passenger need something out of it? No need to lift your elbow. She can lift up her side. Do you need to stick something that’s all awkward somewhere? Slide it in that space and still be able to put your elbow down. You must have a place for the elbow. Actually, now that I think about it…do we put our elbows down when we drive? Well, no matter what…it’s a nice feature. You’ll love it if you get it. Have I ever lied to you? 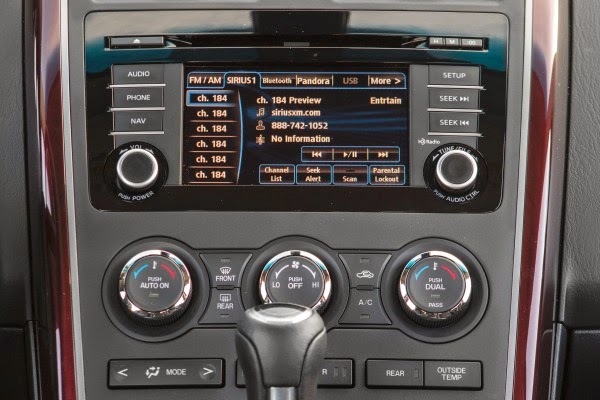 Here’s a close up look at the radio. 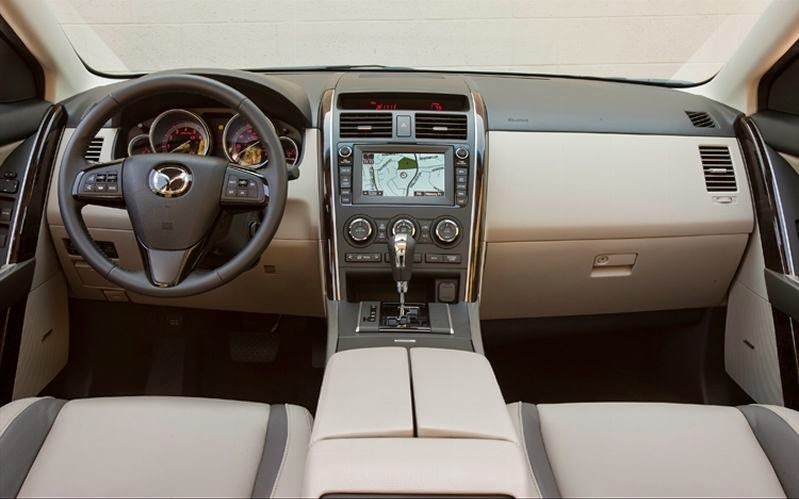 It’s all NASA-like with all the buttons and high-tech features. I loved all the options for music. I also loved that I could plug my iPod into the port inside that cool console up there. You know, the one that really accommodates the elbows well? My favorite part: ALL OF THOSE SEATS. And all of that leg room. I have a tall husband and two tall boys. They need the leg space. They had plenty of it in that car. When those two seats folded down in the very back, there was lots of room for baseball stuff, chairs, baseball stuff, seat cushions and baseball stuff. And legs. In fact, there is more leg room in that car than in the Honda Pilot, Toyota Highlander and the Acura MDX. So, if your family has legs, listen up! This is the car for me. Or, should we say SUV? Overall, I really did love this car. I might love it the most of all the cars I’ve been asked to drive so far. The base price for it was $35,035. It sped up and slowed down really well (how’s that for technical language? ), had plenty of space for mah kids, had lots of neat “extras” up in the front (elbows? ), had a cool sunroof (I looooove a sunroof), was NASA-like and made my friends get all “Ooooo…what are your driving?” on me. You need to get yourself one.